www.louhittarenluola.fi is the webshop of Finnish dye studio Louhittaren Luola, registered in Finland (VAT number FI23110157). 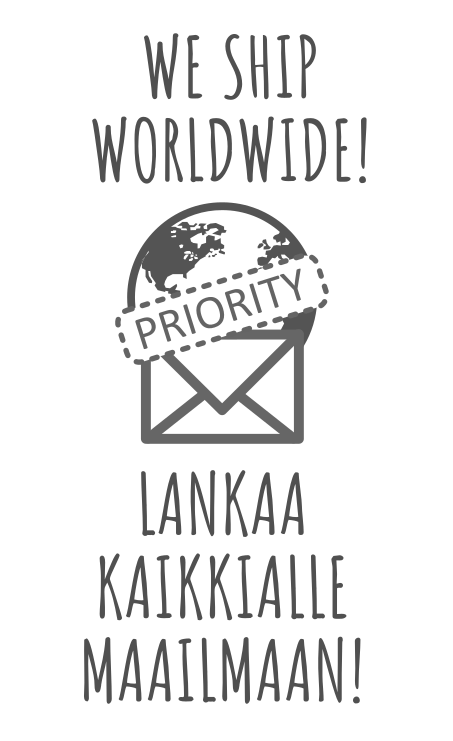 All inquiries concerning our webshop will be answered via email at luola@louhittarenluola.fi or by phone at +358-400-594915 (weekdays 9 am to 4 pm GMT+03.00). You can place orders in our online shop by adding products to cart and proceeding to check out following the instructions given in the order form. Orders can be placed by email luola@louhittarenluola.fi. You must be at least 18 years old and provide a valid email address. You are responsible for giving us your accurate billing and shipping information. When you have confirmed and paid an order you accept the terms and conditions in listed here and create a contract with Louhittaren Luola. These terms and conditions apply unless other agreements have been made. We reserve the right to amend these terms from time to time without prior notice to you. The version of terms that will apply to your order will be those on www.louhittarenluola.fi at the time you place your order. All prices include VAT (24 % or 10 %). All prices are in euros (€). Shipping and packing is not included in the price of each product. All payments will be taken in the currency the price is displayed at on the site. By ordering from this webshop you agree to these terms. These terms apply to all orders unless specific details are agreed in writing upon ordering. After completing your order by checking out and paying, you will receive an order confirmation email to the email address given in the order form. You should check that the details in this order acknowledgment are correct, and keep a copy of it. You will receive an order dispatch confirmation for your order via email once your order has been shipped. The completion of the contract will take place on the dispatch to you of the goods ordered unless we have notified you that we do not accept your order, or you have cancelled it. The contract will relate only to the goods stated in the order confirmation. We will not be obliged to supply any other goods, which may have been in your order until you receive an e-mail confirming those goods. Louhittaren Luola is not responsible for incorrect information regarding the number of items in stock. We reserve the right to amend or alter the stock quantities or prices on this site without prior notice. If the product is in stock, the number of available items is reflected below the item price. Items are sold individually, and the price is for one (1) item. See product description for more information. If the item you are looking for is not available, choose the custom order option, and we will dye the necessary skein(s) for you. If an item is not listed on our webshop at this time, it is not in stock and custom dye orders cannot be placed for it. The prices on this site include VAT 10 % or 24 %. Posting and packing is not included in the price of each item. You will be charged for posting and packing separately based on the total sum and the weight of your order. You can pay for your order directly via online bank transfer or via Paypal. Please contact us if you experience any problems when submitting your payment. All custom colorways are dyed separately for you. We cannot guarantee the same exact shade onto the next batch so please order the amount necessary for you to complete your project. These custom colorways are always special cases, so they will be charged a moderate 10 % extra per skein. All custom colorway orders are not applicable for the return or refund terms below. We provide as accurate and helpful information as possible to our customers. We are happy to answer any additional questions you may have. The inclusion of any products at www.louhittarenluola.fi does not warrant that these products or services will be available at any time. We reserve the right to discontinue any product at any time. Louhittaren Luola is not responsible for invalid price or stock information. If you can’t add a product to cart, it is not in stock right now. The same products listed in the online shop are available at our factory shop in Martinniemi, Finland. If a product you ordered was sold out or not in stock for other reasons, we contact you as soon as possible and try to find a suitable replacement. The product photos are chosen so that they represent the product and color the best, most realistic way possible. Please note that the colors may look different on different devices and monitors. All orders will be dispatched only after confirmed payment. We aim to dispatch orders in the fastest possible time and in the order in which they are placed. All orders will be shipped within 2-6 days if all products ordered are in stock and unless otherwise agreed. We process and ship nearly all orders within 1 business day (often the same day). Delivery times are an estimate and not a guarantee. Please note that campaigns and holidays are a busy time at our warehouse, and some items may be dispatched a little later. We will contact you in case of delayed dispatch. Custom dye jobs and custom lots of chart colorways will be shipped 2 to 4 weeks after confirmed payment. We make our best efforts to dispatch them sooner, but we ask for your patience especially in campaign and holiday seasons. Free shipping for orders over 100 € (after discounts and gift cards, order weight must be less than 5 kg). The Finnish shipping methods are presented in Finnish. See translations below. Orders are shipped by Posti or Matkahuolto. Matkahuolto packages are dispatched 2-4 times a week. Please note that when you need the products to be dispatched fast. Posti Letters under 3 cm (small items or one skein opened). Estimated shipping time 2-3 business days. Will be delivered to recipient mainly on the second business day after dispatch. Non-trackable. Posti’s parcel to a parcel point service. A parcel point is an easy and convenient way for your customer to receive items in Finland and Estonia. A customer shops in your online store and then selects the parcel point as the delivery type and chooses the preferred pick-up location. The item will be in the parcel point selected by the customer the next day after 4 p.m., or a day later in some areas. An electronic notice of arrival will be sent to the recipient as an SMS, and the delivery is available for pick-up on the day of arrival after 4 p.m. at the parcel terminal with the locker code. The recipient also receives an e-mail copy of the notice of arrival. Trackable. The recipient can pick the parcel up at the Posti outlet on the day of arrival (mostly the next day after dispatch) after 4 p.m. An electronic notice of arrival will be sent to the recipient as an SMS when the delivery is available for pick-up on the day of arrival after 4 p.m. at the postal outlet with the item ID. If there is no mobile phone number available, the notice of arrival will be sent by mail. The recipient receives an e-mail copy of the notice of arrival. Trackable. Orders will be shipped by the Finnish post service Posti as a Priority or Economy Letters. Letters are delivered to the recipient on a standard delivery round; no signature required. No tracking provided. You can also choose International Priority Package, which will include tracking info. Rest of the world 6-14 working days. The time required by potential customs procedures is not included in the estimated delivery speed. All international customers are responsible for your country's customs fees and duties. Customs forms are filled out in accordance with Finnish and international law to accurately reflect value and contents of the package. Did you receive faulty or damaged goods? Please check the condition of items immediately upon receiving your package. If you have received a faulty or damaged item or if some items are missing from your package, please inform us immediately at luola@louhittarenluola.fi or by phone at +358-400-594915. If your order contains faulty or damaged goods or some items are missing, we will ship the replacement products to you without any additional charges. We will replace the faulty item without additional charges. In the case of a wrong product we will ship the missing skeins without additional charges. We aim to photograph and describe each item as accurately and truthfully as possible on our site. However, we dye several skeins per batch, and only one skein is photographed. The item you receive may not be the item we photographed for each listing. Each batch is hand dyed and each batch takes dye differently, which means the skein you receive may have darker or lighter areas than the skein in the photo or it may be spotted. Additionally, only a portion of each skein is shown in the photograph, so the skein you receive may appear rather different from the photo. This applies especially to speckle-dyed or high-contrast colorways. Always contact us immediately, if you suspect you have received wrong products. All returned items must be unopened, unused, in original packing and with all the original labels in place. The customer will return the item at their own expense. When we have received the returned items at our warehouse, we will refund the items to your bank account or as a gift card within 14 days after receiving the items. Returns or exchanges will not be received at the warehouse after 14 days of received orders. If you have received your order and wish to exchange products to other items, you can do so without extra charges once per order. We will then refund the postal charges for returning the items as a gift card or as a deposit to your bank account. When exchanging items, the new items will be shipped after the returned items have been received at our warehouse. Please note that failing to pick up your package is not considered to be a cancelled order. If you fail to pick up your package, we will charge new postage and shipping charges and an additional billing charge of 3,90 €. You have an option to cancel the order, but we will not refund the posting and shipping charges. By placing an order with us you agree to these terms. The completion of the contract will take place on the dispatch to you of the goods ordered unless we have notified you that we do not accept your order, or you have cancelled it. The contract will relate only to the goods stated in the order confirmation. We will not be obliged to supply any other goods, which may have been in your order until you receive an e-mail confirming those goods. If the contract disputes cannot be resolved between the customer and Louhittaren Luola, the customer can take the issue to the Consumer Disputes Board (http://kuluttajariita.fi/en/index.html) or the ODR forum to be resolved. The Online Dispute Resolution website is an official website managed by the European Commission dedicated to helping consumers and traders resolve their disputes out-of-court. Before taking the issue to the Consumer Disputes Board, the customer must contact the Finnish Competition and Consumer Authority (www.kuluttajaneuvonta.fi).